Before I dive into this weeks Friday Mashup challenge I want to remind everyone that we currently have the Friday Mashup Fan Favorite contest going on right now! Think you have a great idea for the Mashup blog? 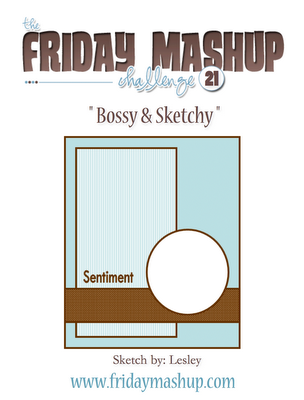 Write up a post on your blog and then go submit it at the Friday Mashup!Fans will vote on their favorites and the winner gets to host their idea for the Friday Mashup blog! Lets see those creative minds at work! Speaking of creative minds, this week our challenge comes from a VERY creative mind, Lesley(check out her blog and see what I mean!). She's providing us with a CAS sketch this week, and also wants to see some dry embossing. Create a project using the provided "Sketch"
or Create a project that has a "Dry Embossing on it"
or "Mash it Up!" and create a card using the "Sketch with Dry Embossing"
Its your turn...head over to the Friday Mashup blog and play along with us! Dont forget to go check out the cards the design team made for inspiration! Lisa, I love your card, that orange embossed background is so bright and really helps to highlight your three leaves. Love the way you've popped them up to add dimension and added the rough edges and sponging. Fabulous! Your card is great, Lisa. Fall is my favorite season and I'm finding I'm moving towards those colours and themes too now. What I love about your card is that it has a fall theme, but it's still nice and bright! Awesome. So perfect for fall for sure and I love the added dimension! This is SO pretty! I love the clean lines and the bright colours. I'll bet you are getting ready for Fall/Winter...I remember one time in the Yukon is snowed on August 21st!!! It was crazy!!! LIsa, I love these bright fall colors! This is such a delightful card! Slow down there Missy I know you are itching for Christmas to get here.. It's still summer but I do love fall but I'm not ready for Christmas so I'm in no hurry for fall to get here. This came out great, I love the clean look of it and how you used those images with the sketch and perfect color combo! This is wonderful! Love the CAS design and the fall colors. Leaves will be changing soon around here!! Your autumn leaves are gorgeous. Lovely bright colours.